December 23, 2009 - Spanish airline, Air Comet on Tuesday suspended all of its flights due to financial difficulties, which resulted in the approval of a London court approving Nord Bank of Germany to initiate foreclosure procedures against the airline. Thousands of passengers have been affected and hundreds of employees are with out jobs. Air Comet, formerly Air Plus Comet is located at Madrid Barajas International Airport in the capital of Madrid, Spain. It operates scheduled long-haul services from Madrid to Central America, South America, United States, Caribbean and throughout Europe. The company had codeshare agreements with Air Europa and AeroSur. Back in August, Air Comet 640 employees went on strike for 8 days over non payment of wages. According to the union, who has called the strike, 150 workers had not received salaries since June, in some cases employees had not been paid in six months and some have not received their summer double pay. Air Comet workers had reported they would cancel their indefinite strike, until December 22, 2009. As Air Comet company president, Gerardo Diaz Ferran, had announced he would see to it that employees would begin receiving pay and he would pay employees for money owed in from the past. Union representatives had indicated they would resume the strike if the company failed to comply with the proposal to pay employees. The airline was established in December 1996 as Air Plus Comet and started operations in March 1997. It mainly operated long-haul charter services from Madrid and Palma de Mallorca to destinations in America and the Caribbean. It re-launched as a full service carrier under the Air Comet name in January 2007. It is wholly owned by Grupo Marsans. In January 2007, Air Comet took over some of the now defunct Air Madrid Airline's Latin American routes. It also accepted passengers left stranded (those who had already flown a portion of their ticket) for a flat fee of 200 USD. 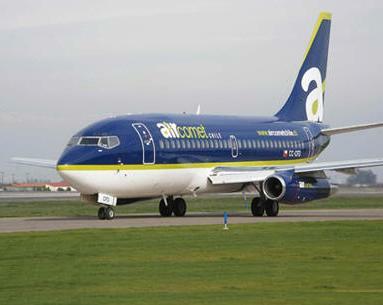 On 25 May 2007, Air Comet suspended its flights to the United States, citing a desire to focus on growth in the European and Latin American markets. In September 2008 Air Comet suspended temporarily two of its routes, to Santiago de Chile and San José de Costa Rica, in order to be able to raise the frequencies in other routes until all the new planes arrive. As of 11 February 2009, Air Comet has been suspended from IATA Clearing House due to non-payment of January balance. Air Comet has failed to pay a significant number of its staff salaries dating back to January 2009. As of 19 February 2009, the average age of the Air Comet fleet was 12.2 years old.